There’s nothing better than coming home from the gym and pouring an ice cold drink of water. Also, Texas summers are blisteringly hot, so after a couple hours spent mowing the lawn and using the weedwhacker to trim the edges, you want relief from the scorching summer sun in the form of an ice cold drink of water, but without a functioning ice maker, that drink of water is just a little less refreshing. What if you’re hosting a family gathering and your freestanding ice machine breaks? Backyard BBQs rely on ice. Keeping beer, wine, and soft drinks cold in the hot summer days is crucial to the success of your party, preventing foot traffic in and out of the kitchen and allowing for excess food storage in the refrigerator. So, when the ice maker fails, you want to place your trust in ice machine repair professionals who can get it back into working order. Appliances have become increasingly complex, and fixing them on your own isn’t advisable. Instead, contact our professional appliance repair professionals. Aces Appliance & Repair has over 20 years of experience performing high-quality appliance repair. From washer and dryer to ice maker repair, Keller, TX residents trust us to get the job done. We’re prompt and on time, meaning your wait time is dramatically reduced. You’ll be back to living normally in no time. Modern ice makers have become increasingly complex, especially as fully-digitized interfaces have been integrated into ice maker technology. It can be frustrating to determine the root cause of the issue you’re facing. While each manufacturer’s ice machine is different, all receive water through a supply line that runs from the fridge to a water pipe, and some ice makers use a funnel or water filter. Ice machine failure can take numerous forms, including total machine shutdown, water production but no ice making, insufficient cubes, leaks, and freezing. Aces Appliance & Repair provides superb ice maker repair to Keller, TX residents because we not only understand how ice machine appliance work but also know how to quickly diagnose the problem. Inexperienced technicians waste time trying to figure out what’s wrong because they don’t understand the differences between the multitude ice makers on the market. We do. 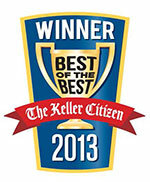 It’s part of why Keller, TX trusts us for appliance repair. Total shutdown: If your ice machine no longer produces any ice whatsoever, it could be caused by a variety of issues, including a control arm that is out of position, a clogged or turned off water line, a clogged filter, and/or a broken inlet valve. No ice production: If control arm problems, clogged water lines or filters, or a broken inlet valve aren’t responsible for this problem, a frozen water line might be. Our technicians know how to resolve the issue and get it working again. Insufficient ice production: The root cause is usually a frozen water line. However, this typically means the line is merely in the beginning stages of freezing. Leaks: Leaks can be caused by a variety of problems, from unlevel refrigerators and ice machines to damaged or pinched supply lines. The fill cups can also fall out of alignment. Frozen ice makers: Ice machines have thermostats, and sometimes the thermostat breaks. When that happens, the ice maker will freeze. There are other causes, all of which Aces Appliance & Repair can handle. We’ve built a sterling reputation for honest, affordable, and thorough appliance repair in Keller, TX. Ice maker repairs can be time sensitive. If your son or daughter’s high school graduation is fast approaching and the ice machine dies, you want to deal with an appliance repair company that respects your time. As a locally-owned and -operated company, we understand time is a factor. That’s why we pride ourselves on our promptness, arriving when we say we will and quickly diagnosing what’s causing the problem. We make sure to bring the tools and parts we need to finish the repairs, and we always give you an honest quote. More importantly, we’re skilled at repairing ice makers from all manufacturers, including KitchenAid, Maytag, Magic Chef, GE, Kenmore, LG, Admiral, Frigidaire, and many more. Each manufacturer has slightly different specifications, and our technicians are familiar with all of them, so contact us today for refrigerator, washer, dryer, and ice maker repairs in Keller, TX.